Cessna introduced the Citation Longitude at EBACE 2012. Six months after launching its midsize Citation Latitude, Cessna Aircraft (Stand 7081) announced at EBACE this morning that it will offer a $25.9 million (2012) stretched version, the “Longitude,” that can fly 4,000 nm at Mach 0.82. First flight is scheduled for 2016. The Longitude/Model 800 will be the largest Citation attempted since the Columbus/Model 850 development program was terminated in 2009. Scheduled to enter service in 2017, the super-midsize Longitude uses the same fuselage cross-section, windows, passenger seats and aluminum construction as the smaller Latitude, but will be nine feet longer. The 31-foot flat-floor cabin will have passenger seating for eight, and the aircraft will have a full-fuel payload of 1,950 pounds and an MTOW of approximately 55,000 pounds. MTOW takeoff distance is an estimated 5,400 feet. Required runway distance drops to 4,000 feet on missions of 2,000nm or less with lighter loads. High-speed cruise is Mach 0.84 and maximum operating Mach number is 0.86. The Longitude will be powered by a pair of Fadec [Full Authority Digital Engine Control]-controlled, 11,000-pound thrust Snecma Silvercrest engines, with autothrottles. They are expected to power the aircraft to 43,000 feet in 23 minutes on the way to a ceiling of 45,000 feet. The engine hot sections and the times between overhauls (TBOs) will be “on condition,” much like airliner engines are. Mike Pierce, Cessna director of product marketing, said that he expected this practice to increase actual TBOs from between 20 to 30 percent beyond the highest time engine TBO in the current Citation fleet. That distinction falls to the Rolls-Royce AE3007C engines on the current Citation X, with a 6,000-hour TBO. The selection of Snecma, a subsidiary of France’s Safran Group, is the most dramatic imprimatur placed on Cessna to date by Ernest, who joined the company last year after 29 years in senior management at GE Aircraft engines. Cessna has traditionally used engines from Pratt & Whitney Canada, and to a lesser extent Rolls-Royce and Williams to power its Citations. Snecma and GE formed CFM International in the mid-1970s to develop a new generation of high-ratio bypass CFM56 engines that now power most of the world’s fleet of Airbus A320 and Boeing 737 commercial aircraft. Announced in 2006, the Silvercrest engine has been the long-rumored choice for Dassault’s under-development SMS/5X twinjet but, until Longitude, it had not found an official home. Snecma claims the Silvercrest will be quieter, cleaner and more efficient than current engines in class. The company claims a noise reduction of up to 20 EPNdB versus Stage 4 requirements; a 50 percent NOx margin versus the ICAO CAEP 6 emissions standard, and 15 percent lower specific fuel consumption compared to current engines. The engine is also designed to be lighter and have fewer parts than its contemporaries. It features a wide-chord swept fan followed by a four axial stage, and one centrifugal stage, high-pressure compressor driven by a single-stage turbine. Initially the engine will be supported by parts-depots in Dallas, Paris and Asia as well as the Cessna product-support network. The engines will have live health and usage monitoring (HUMS) capabilities. In another departure for Cessna, the Longitude will have limited fly-by-wire (FBW) capabilities for controlling the rudder, spoilers and brakes (“brake-by-wire”). Pierce said the decision to go with a limited FBW was a function of potential weight savings versus increased cost and certification complexity. “Hosting a FBW solution on the airplane is a very integrated solution with your avionics package. We settled on the roll spoiler and rudder systems as the places where we can [extract] the most advantage in terms of weight [reduction] and cost [savings],” he added. Not all of the Longitude’s details are fixed. The aircraft is projected to have a length of 87 feet and a wingspan of 84 to 86 feet. The 30-degree swept wing will incorporate leading-edge slats, winglets, centrifugal ailerons and five speed-brake/spoiler panels per side. Roll control will be augmented by the outboard spoilers and there will be three flap panels per side. The slats will be controlled hydraulically, and the flaps electrically. Ailerons and the elevator will have mechanical back-ups. The T-tail will measure 25 to 26 feet tall, have a sweep greater than 30 degrees and feature a fully-trimable horizontal stabilizer. The electrical system builds on the essential bus system Cessna developed for the CJ4, Citation Ten and Latitude: Primary power comes from the left and right engine generators with backup power from the alternators and a dual battery system. The dual hydraulic system uses a mineral-based fluid and, in addition to controlling the slats, controls nosewheel steering, thrust reversers and landing gear. The main gear is dual-tire trailing link, the nose gear is dual tire and features a limited amount of rudder steer and a wheel tiller. Cabin pressure allows for a 6,000-foot cabin altitude at FL450. The pressurization system uses an air cycle machine as its primary source with bleed-air back-up through heat exchangers. The back-up system is adequate to provide constant temperature in the dual-zone controlled cabin. The cabin itself features a large forward galley and aft lavatory with vacuum-flushing toilet. The forward cabin may include a crew lavatory as well as a third crew/flight attendant seat. Like the Latitude, the Longitude’s interior cross-section is 72 inches tall and 77 inches wide. The forward club-4 configuration is 200 inches long and the single executive seats are full-berthing. There is room for another club-4 in the aft cabin or a three-place divan, certified for takeoff and landing, opposite an entertainment center with large flat-screen monitor. A four-foot deep pressurized baggage hold can be accessed through the back of the lavatory to facilitate changing of clothes or luggage retrieval. Aft of that, the aircraft also has a larger externally-accessed baggage hold. Pierce said Cessna has selected the Garmin G5000 for the Longitude, using the same three-screen “touch control” avionics architecture that the company is using on both the Latitude and Citation Ten. He added that the cabin management system (CMS) will build on the new wireless “Clairity” system that Cessna is developing for the Latitude, Ten and M2. The Clairity system can host global airborne Internet and voice communications. 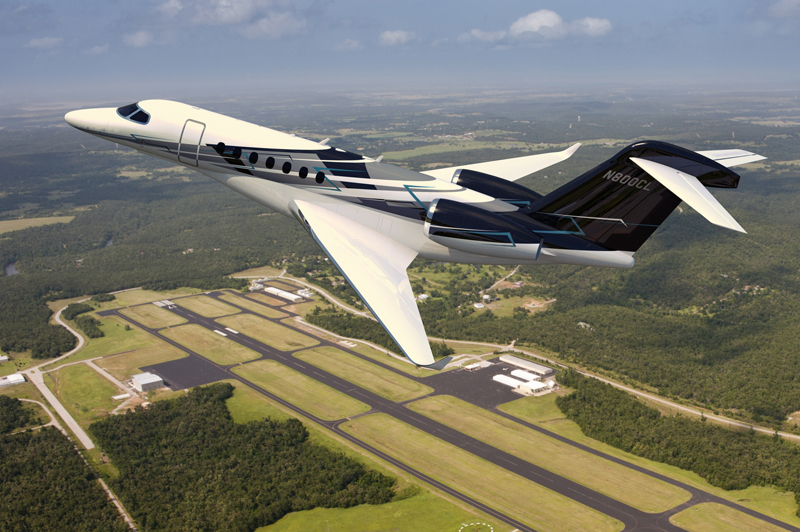 Initially, Cessna plans to build the Longitude in Wichita and the company is not currently enlisting any risk-sharing partners on the airframe. Notably, “This is not the large-cabin jet that we’ve talked about building in China with our partner AVIC,” Ernest told AIN. “That aircraft will be something different,” though he would not elaborate further. The airport in the background is KOWP..
it looks like another home run for cessna, nice to see them doing it again.